Summer is right at our heels and Soak City is open for it's 2018 season. I've rounded up a few ways to save on admission and several ways you can win a visit including parking, food and admission for four! Knott's Soak City Water Park is now open on select days through September 9. Orange County's largest water park boasts a total of 22 speed, tube and body slides plus a giant wave pool, lazy river and interactive kids area. Last year Soak City expanded the water park by adding seven new slides as well as Shore Break and The Wedge along with the remodeled Longboard’s Grill. Additional seating areas and new spacious cabanas were also upgraded with spacious seating areas within the 2 acre park expansion. Here are some ways to play and save! Save $8 on regular Knott's Soak City Waterpark Admission with a coupon from your local Los Angeles and Orange County McDonald's. The bonus, a portion of the proceeds will benefit the Ronald McDonald Hosue Charities of Southern California. If you are not a Knott's Soak City pass holder, it's not too late! You can get their GOLD pass starting at $122 and it's valid for both Knott's Berry Farm and Soak City thru the end of 2018. Proper swimwear is required. Swimwear is defined as a one or two piece swimsuit. Transparent, thongs, or provocative clothing is not permitted in the park. Pants and/or denim are not permitted on the slides. Knott's Soak City reserve the right to determine the appropriateness of swimwear. Unopened water bottles, baby food and food for guests with special dietary restrictions are permitted. No other outside food, drink or snack items are permitted to be brought inside Knott's Berry Farm or Knott's Soak City. Items also not allowed in the park include radios, stereos, cassette recorders, sleeping bags, luggage, bicycles, skateboards, roller blades, and large coolers (Larger than 1’x1’x1’). Wagons used as strollers are allowed. Selfie sticks are allowed in the park, but may not be used on rides. 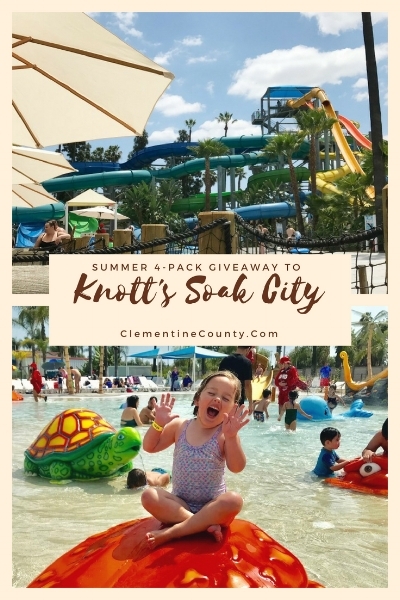 I have a roundup of a few ways to enter to win a giveaway package to visit Soak City! Check out these local bloggers and be sure to enter by clicking on the pictures below! Here's what you can win! For Hours, days of operation, faq's and to buy tickets be sure to visit Knott's online to save time and money so you have more of it to enjoy at the parks! And be sure to check out these other articles for Knott's!